This is the mantra I often return to when I am feeling overwhelmed and under-enthused about my current situation. It is so easy to avoid going out and stepping to the plate when you are feeling a little “less than stellar” but in the past going out and stepping to the plate is the only thing that has lifted me up and taken me to the next opportunity. Any gathering from a social event to a network luncheon can spawn a relationship or at the very least a feeling of camaraderie and support. Last week, I helped organize and plan a Woman’s Luncheon for a client. I was feeling slightly anxious about entering a room of highly successful and qualified women and “leading” them in any sort of discussion. I was worried I would seem under qualified or that my current job situation, being a bit more tenuous than I would like, would prevent me from speaking with pride about my profession and what I hope to offer the world. These fears circled around my head until I was able to quiet them with my gentle universal reminder, “just show up.” I did just that, I showed up to this event as honest and open as I possibly could and I am so very happy that I did. Vulnerability is so universal and I was humbled to come to realize that almost everyone was intimidated and feeling insecure about their standing amongst a group of “successful” women. As each woman spoke and shared their story the layers peeled back and regardless of age, profession, personal achievements, or background, we all could relate to one another’s struggles and insecurities. The topic of the lunch was transformation and it was enlightening to realize that we are all evolving and transforming in every moment and that in many ways transformation is the only constant we can anticipate throughout our lives. Armed with this knowledge, it became evident that as we age we will continue to be provoked by change and faced with uncomfortable uncertainty. These happenings will naturally manifest into fear and feelings of vulnerability but perhaps we can learn to get continually stronger in their presence. Trust is not something that often comes easily, especially when you are stuck in a whirlwind of your own emotions, but for me it all comes back to three little words, “Just Show Up.” How often in life do we miss out on opportunities because we did not show up? Whether physically show up to an event during a time of personal struggle or in a more metaphorical sense, to show up for yourself by taking whatever steps you can to bring you closer to your end goal. Maybe harnessing the courage to be present and taking small intended actions every day is all that is required of us in this life. For now I will hold on to this principal and be comforted by the knowledge that I am not alone on this journey. I hope you too will be comforted by this sense of universality and that together we can lift some of this heaviness and remind one another of the power of our collective conscious. 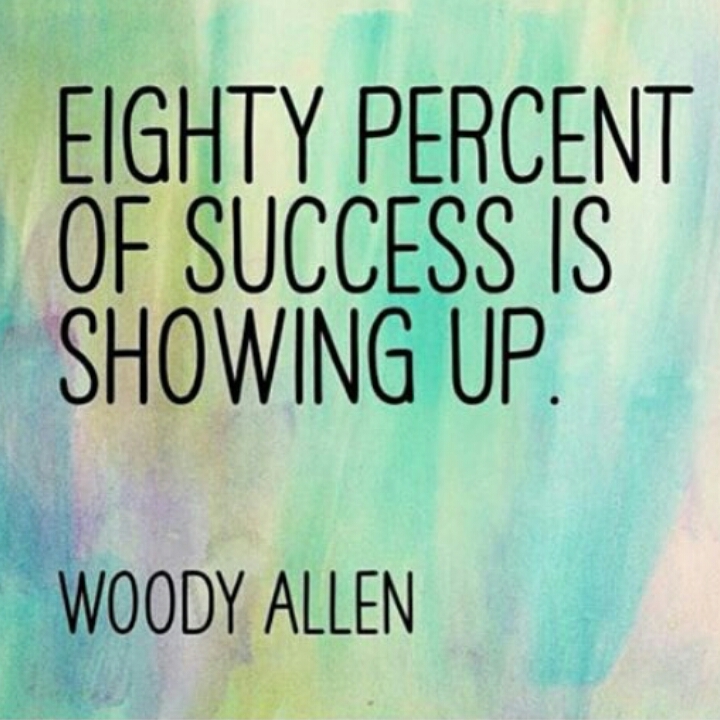 So, get out there this week and show up for yourself in a new way! Whether that be saying “yes” to an invitation you would normally turn down or trudging some new unchartered terrain towards your end goal, let’s all work towards finding new ways to engage momentum and summon transformation in our lives! As always, thank you for being such an incredibly supportive group. I am so honored and blessed to have you all in my life. The encouragements and kind words I received regarding my last post were overwhelming and incredibly uplifting and helpful. I am so very grateful to have such a loving and supportive community! Thank you for reading and being a part of the Fatty on a Diet Family!